Summer Wars is an animated film released on August 1, 2009 in Japan and in North America on February 15, 2011. It is produced by Madhouse and directed by Mamoru Hosoda. Kenji is young Japanese math genius who works as a part-time moderator for OZ, a virtual reality social networking world that has become an integral part of life in Japan. Taken by his friend Natsuki to her great-grandmother's 90th birthday, he cracks a code which exposes OZ to a security breach and heavily damages the infrastructure of Japan. The movie follows Kenji, Natsuki and her family as they frantically try to save OZ, discovering the value of family in the process. Summer Wars tells a compelling and endearing story of family through the eyes of Natsuki's family as they attempt to save OZ. The story is awesome because it manages to fit the grounded nature of its characters with the fantastical events that take place in OZ. The movie never loses its message of family as it proceeds, moving the plot along at a good pace before reach its climax and satisfying conclusion. The characters of Summer Wars are great, and the interactions between characters are fantastically written. Natsuki's family is hilarious, and this is shown through the way they interact with each other. They bicker, they fight, but ultimately they stand by each other no matter what. Anyone with a big family will find their interactions extremely gratifying to watch, and it is very poignant the way they interact with each other. Special note should be taken of the interactions of the family and their great-grandmother Sakea, as her character and personality have a profound impact on the values and actions of the family. The world of OZ is a beautifully realized one, and the character design is a highlight of the movie. Love Machine is the highlight of the character designs in OZ and is absolutely amazing to look at, and all of other avatars are creatively done. This really conveys the contrast between the fantastical nature of OZ and the grounded portrayal of the real world. It worth noting that this movie quite funny. This is highlighted by the character interactions which are very frequently humourous and extremely well written. It's very satisfying and keeps the tone of the film lighthearted. The animation quality in Summer Wars is hit and miss, varying between outstanding and just passable. The animation in OZ is simply fantastic and full of colour, drawing viewers into its world. A particular scene at the end of the movie is beautifully drawn and is really a highlight of the movie. In comparison, the animation quality in the real world is rather pedestrian. Characters are relatively plainly drawn and unremarkable, and it would have been nice for more memorable character designs. However, this plainness makes the movie more relatable in some ways because it emphasizes that Natsuki's family could be a stand in for anyone's family. Furthermore, it serves to contrast the virtual world of OZ with the ground nature of the real world. Kenji and Natsuki's relationship is told a little bit unevenly. The movie doesn't give any real context to why Natsuki picked Kenji specifically to come to with her to her family gathering when it seems like they are just casual acquaintances. Their relationship throughout the movie does not progress as smoothly as it could have and does not receive a ton of emphasis. This is not a huge problem because the movie is more concerned with the story of the family rather than the interactions between Kenji and Natsuki. However, it would have been nice to see the movie devote a little more time to developing their relationship. There is one particular unresolved plot strand which was not explained as well as it could have in my opinion. I won't go into details as it is a story spoiler wasn't a big deal but I wish there had been more of an explanation about it. Summer Wars is a fantastic ride, telling a great story of family and helping to establish Hosoda among the preeminent directors in Japan. The animation quality could be better but this is made up for by the fantastic character design showcased in OZ. The hilarious and touching depiction of family in the movie is the real highlight of the movie, presenting a compelling tale of family coming together to save the world. Summer Wars can be enjoyed by people of all ages because of its relatable nature, and should not be missed. 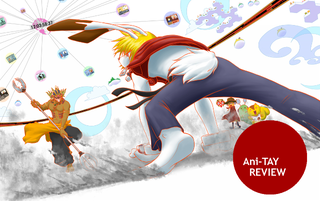 Summer Wars can be streamed on Funimation and bought on Amazon.com and Amazon.ca for those of us in Canada. Check out my other reviews at mdubs-tep.